The InView Extra External Catheter is a latex-free external catheter. The breathable clear silicone material is non-irritating. The plastic disposable cap maintains adhesive integrity for added security and ease of application. 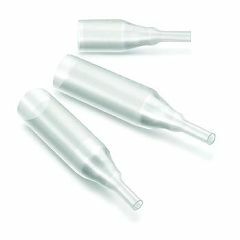 The InView Extra External Catheter is more adhesive than the standard for added security and longer wear time. This product is the best of all brands! I use it as a safety, as i can not get to the bathroom on time when i am in bed, and try to get up. So it is easier to wear a external catheter, than wet my bed. It has extra adhesive which i think makes all the difference. This external catheter will last 48hrs easy with no leaks.